Wondering what you should paint next? Debating whether it should be a sunset or a gorgeous night sky? Take this entertaining quiz and get your answer right away! Answer these questions about your style of painting, and your personality, and get a recommendation for what you should paint next! Don't you want to know? Maybe you would love to paint something gothic, like a cathedral. Maybe you're less spooky, and would prefer to paint rich, tropical foliage? 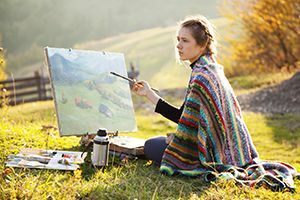 Find out what you should paint next by taking this quiz!